1. What are the advantages of Thermage when compare with other RF treatments? Thermage is a monopolar capacitive radiofrequency instrument which can penetrate deeper than the bipolar or “multipolar” design. The capacitive membrane can prevent epidermal injury from direct passage of electric current and result in volumetric bulk heating of deep soft tissue. 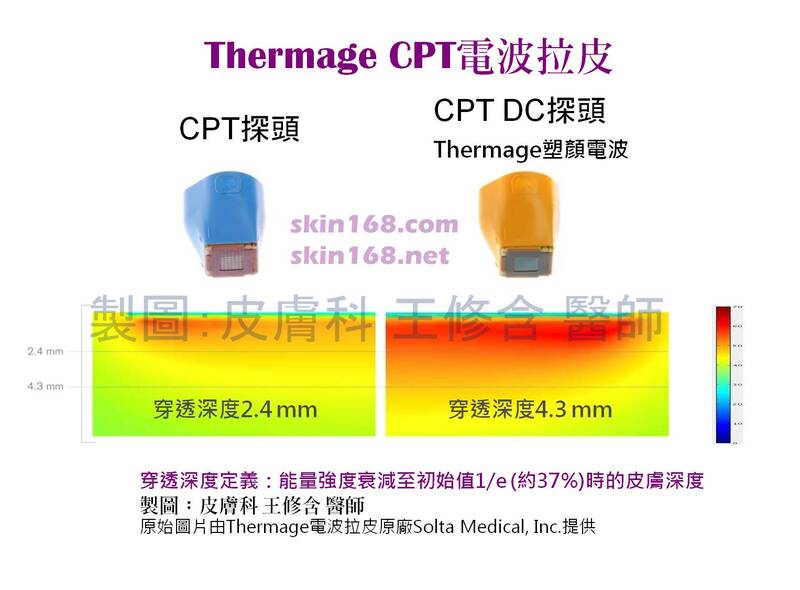 Besides, Thermage developed a Comfort Pulse Technology (CPT) together with vibrating and cooling bursts which can disrupt the pain and protect the superficial skin. It makes the treatment safer, easier and more comfortable. In summary, Thermage can stimulate more new collagen deposition (neocollagenesis) with protective design to prevent inadequate skin injury during a more comfortable treatment if compared with other RF modalities. 2. What is the strength of the new Total Tip 3.0? The revolution of Total Tip 3.0 was based on the common features of previous outstanding versions of Thermage system with a brand new circuit and polyimide capacitive membrane design. The Total Tip 3.0 can safely deliver RF energy to deeper region with as much as two times greater bulk heating volume which results in higher temperatures in the treated soft tissue. This physical property gives better results than other RF treatments, including older versions of Thermage. 3. What’s the different between Thermage and Ultherapy? Thermage is a RF-based instrument, and Ultherapy uses high intensity focused ultrasound (HIFU) energy source. Both systems have the skin tightening results and can adjust the penetration depths according to the needs of physicians. Ultherapy delivers energy to the specific focal regions to coagulate the soft tissue based on the physical nature of ultrasound. If the focused region happens to be the nerve branch, nerve injury occurs. Thermage has the advantage of volumetric bulk heating which can avoid energy concentrated in a specific point to prevent nerve injury observed in the cases of Ultherapy. Besides, the maximum of penetration depths for both systems are similar but different in the action of energy and the resulted biological effects. Thermage Total Tip 3.0 can reach 4.3 mm in depth when the energy decades to 37% that is defined as the penetration depth in physics. It implies the residual 37% energy can be delivered to deeper soft tissue than 4.3mm. With the technique of multi-pass protocol, Thermage can not only provide volumetric bulk heating effect for new collagen formation of whole layer, but also accumulate energy in deeper regions safely without side effects of nerve injury. Ultherapy can focus the HIFU energy to the interested region of 4.5mm in depth, but the total energy is only given at the focused thermal coagulated points. It means the system only acts on the focal regions without bulk heating feature and may damage the nerves situated at the focused locations. 4. How to maximize the results of Thermage? Any recommendations or things that needed to pay attention to for post- treatment? Thermage is the pioneer and leader of non-invasive RF application for skin tightening in recent decade. Several treatment techniques were developed based on the academic studies for this system. For examples, multi-pass vector technique can make the therapy more comfortable and effective. Principles of thermodynamics and biomechanics can also be taken into consideration to improve the response. As for the circuit design, the novel Total Tip can penetrate more deeply with larger heating volume and higher central temperature. Thus, Thermage can provide immediate off-table and long lasting skin tightening results. After treatment, downtime is not required. The patient only has to keep normal daily activity and takes enough vitamin C containing foods with balanced nutrition to facilitate new collagen formation. 5. Which type of person/ skin condition will see less effective result after doing Thermage? Thermage utilizes the RF energy with epidermal protecting cooling system. It differs from the light based devices, such as laser or intense pulsed light. People of all Fitzpatrick skin types can receive this therapy safely without side effects of post-inflammatory hyperpigmentation. Patients with mild to moderate skin laxity will have the best skin tightening response. For ones with severe skin laxity, surgical facelift procedure may be the choice. Besides, according to a study published in 2007, younger patients have better response than older ones for RF treatment.